Hi everyone. Well, there has been a bit of buzz surrounding the new release of Fuji's pro-level mirrorless camera - the X-H1. Personally I vacillated as to whether I would add this camera to my current kit, which includes the Fuji GFX 50s, and a Fuji X-E3. Much of my work revolves around medium format landscape photography with some occasional diving into street and portrait. Though I have carried a Fuji X-T2 and an X-Pro 2 in the past, I sold them in order to make the leap to the GFX. I found over time that I actually missed my X-T2, in terms of being a quasi back-up body along with my GFX. Additionally, when I am shooting on the street I do like to have a second body so I can use two different prime lenses. All that being said I could have added back the X-T2 to my system if it wasn't for the fact that Fuji just tweaked out the X-H1 enough to really draw me in. For my first impressions I am not going to list all of the new features or specifications. Just head over to the Fuji X website if you want all the information. It has the same Fuji X-Trans 24mp sensor, familiar menu system, joy stick, and relative button and dial organization as other cameras in the family. The fact is I knew I was going to receive the same high quality camera that I have come to know and love. But with a few differences that sold it for me. All the buttons and dials are a bit larger and, I think, easier to use. Some early commentors have described this body a heavy. Heavy in my mind is a relative thing. Heavy like a Nikon D-810, or the GFX? Not even close. I do not believe it is any heavier, in feel now, than the X-T2 or even the Sony a7RII. This body with a few lenses is not going to break your back. See the image below to get a sense of the size. That is the X-H1 on the right, next to the GFX and the diminutive X-E3. If I am to draw any comparisons, the X-H1, in its styling, is a mini version of the flagship GFX 50s. It is obviously smaller but carries the same top information screen, ISO and shutter dials, articulating screen, dual card slots, and in my opinion, the smoothest, buttery, shutter button. It is soft, almost touch sensitive, but releases without one feeling the whole camera is slapping and moving as the exposure is being made. It only took a few shots for me to feel completely confident in the shutter release, although I still need more work with it as I will sometimes over pressure the release and fire a shot without being totally ready. Adding to my overall confidence, for me at least, is the addition of the IS (image stabilization), or IBIS, system, which can be set in Continuous (on all the time), Shooting Only (at time of release), or Off. Fuji claims 5.5 stops of IS and it works on all of their lenses. As of this writing I have hand-held down to 1/6 of a second and nailed focus. For my shaky self, that is a huge plus. UPDATE: I continue to love the IBIS feature and this coupled with the grip, and overall ergonomics of the camera body, provides an outstanding, stable platform to make images. These components alone are worth the very reasonable price of admission. Additionally, the new "softer" feeling shutter just complements the whole experience. I use a soft-release on my X-E3, and it is just not necessary for the X-H1. All of the AF-C functions are included and Fuji has apparently made the AF System faster and more responsive. This is quite true even with my older model Fujinon XF35 f1.4 lens. It even seems to lock on better in lower light conditions but I will need more testing on this. Using the wide-tracking AF and one of the custom settings I was easily able to lock on to the action during some street photography. Fuji has upgraded the video capabilities as well and added an additional Film Simulation - Eterna - to the library. It should be noted that Eterna is quite flat and low in contrast compared to the other Film Simulations but this gives a good starting place for color-grading videos. Like all of the simulations it is only applied to the JPEG files and not the Fuji RAF, raw files. Well, I think this is probably a good place to stop and take a look at some image captures. 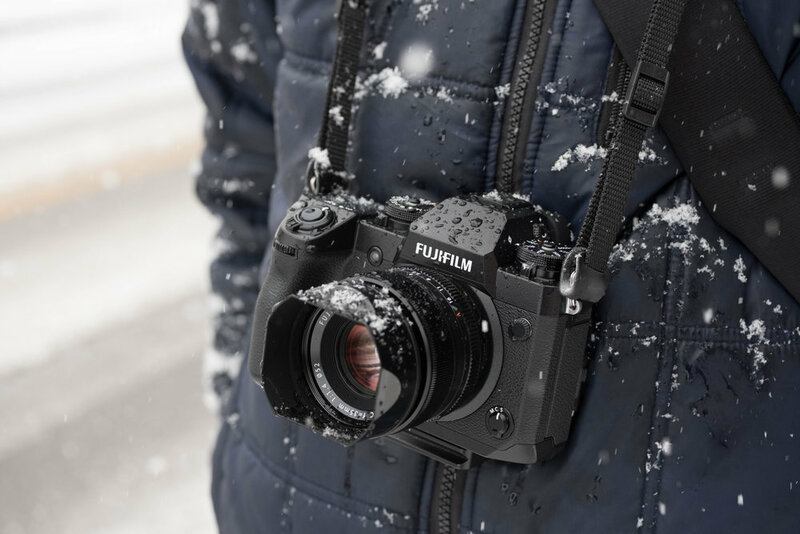 My overall impression is that Fuji has really worked on creating a new camera that should appeal to both still and video shooters, though I will use it primarily for still photography. The feature set is rich and well thought out in only the way that Fuji can, and functions in that familiar way we have come to expect. In fact, already being a Fuji shooter, made my start-up time to understand this camera minimal. We have the same organized menu system and functionality. It is truly solid, well built, nicely finished, and feels great in the hands. Did you ever have one of the cameras that you just like to hold? Well, this is one of those. Button placement is well thought out and I like having the top information screen, like the one on the top of the GFX. The question might arise as to whether you should you add this one to your kit? If you already have an X-T2, and perhaps another body like the X-Pro 2, then maybe not. But as a second body that would complement an X-T2, then I would say absolutley. If you don't have the X-T2 then I would give this one some serious consideration. What I do not like can be summed up in just a small list of items, and this coming only after about a week of use. I am not a giant fan of the touch screen especially now that I have lost some shots with inadvertent activation. The Q Button, at the point of the thumb rest, though accessible, is one that I hit all the time and wish was located somewhere else on the body. And lastly, the Command Dials are stiff and there are times when I am making an exposure adjustment, that the amount of pressure I need to move the dial causes me to press it, sending me into the magnify view. I am going to assume the dials will "loosen" up with some use. This is all minor especially compared to the big pluses. So, let's take a look at a few images shot with this camera. Lenses used for these shots include the XF18mm, the XF23mm f2, the XF35mm f1.4, and the XF50mm f2. NOTE: For the best viewing experience Click on the image and view in LightBox Mode. Notes on Processing: All files were shot as Fuji RAF raw and converted in Adobe Lightroom. In LR adjustments were made to overall image tonality and sharpness, and in some cases I applied either a preset or converted to ACROS or Classic Chrome. These files were all finished in Adobe Photoshop using my (a)typical, iterative, luminosity masking workflow. I hope this first impression proves helpful and gives you some things to consider in your decision making process. I appreciate your support and for stopping by the site.